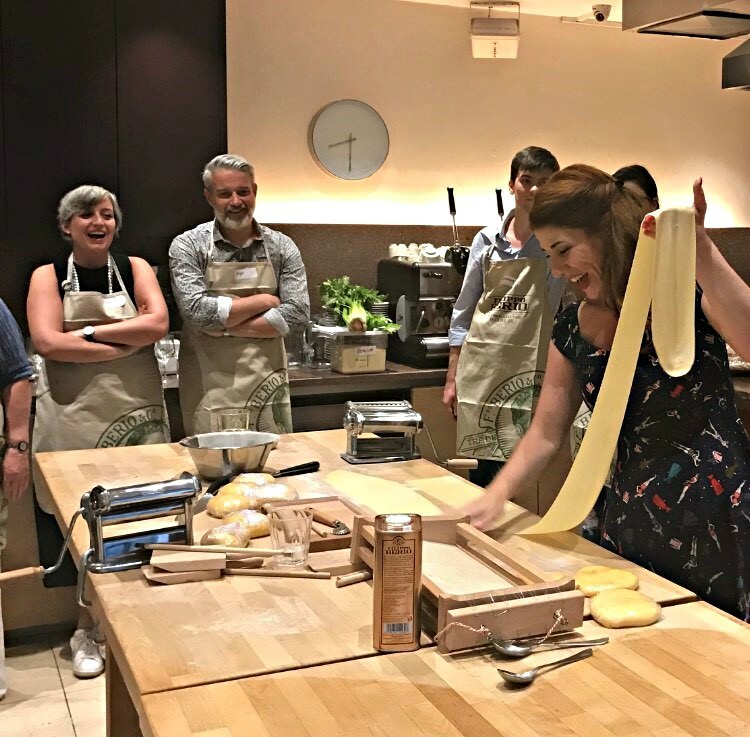 As part of our 150th anniversary celebrations, we invited the lovely Carmela, specialist pasta maker, author and food writer to join us at La Cucina Caldesi, for a pasta masterclass on Saturday June 24th. 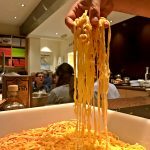 Twenty enthusiastic pasta lovers, joined the team at Filippo Berio to learn the art of specialist pasta making with Carmela, and enjoyed 5 delicious courses, each paired with a specially selected wine from Zonin 1821. Carmela is a published author of two fantastic Italian cookery books, ‘Southern Italian Family Cooking’ and ‘A Passion for Pasta’, released the 2nd May this year. Cooking simple, inexpensive, seasonal dishes whilst using good quality seasonal ingredients as her mantra. After enjoying some Prosecco, tomato foccacia and having a nibble of our brand new flavoured Crostini snacks, Carmela introduced herself and the menu to our guests. 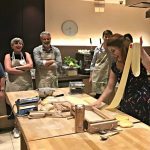 Carmela began with a demonstration of the pasta dough, of which she had two variations of the guests to get stuck into- semolina flour and water or semolina flour with water and tomato puree. Whilst preparations for the sauces, and starters were being prepared by the lovely kitchen porters at La Cucina Caldesi, the guests learnt how to perfect the art of kneading, shaping, and rolling their pasta dough, along with all the tips and tricks along the way of how to do it yourself at home, and how to cook ‘cucina povera’ style, like Carmela. Once the dough had rested, the guests began to shape their pasta. The first pasta dish, was a delicious pumpkin and amaretto filled ravioli, with crushed amaretti biscuits- the perfect example of a delicious sweet and savoury dish. Using a pasta maker or rolling pin, the guests rolled and shaped the ravioli, and topped with the pumpkin filling, ready for topping and boiling. The second pasta dish, was Carmela’s tomato garganelli pasta with pan-fried summer tomatoes & pine-nuts. While the sauce was being prepared, the guests starting rolling their dough, and used Carmela’s special gnocchi boards, to roll and shape their garganelli. Finally, the guests were treated to Pasta alla Chitarra with sweet peas, lemon and shallot dressing. 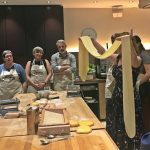 Guests were wowed by Carmela’s ‘Pasta harps’ of which she uses to roll the thin pasta dough and pluck the strings like a guitar, so the thinly sliced chittara would fall out seamlessly, ready to be used. 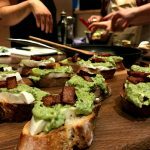 Once all the pasta was made, guests prepped the starter, which was a rich and creamy basil and stracchino pesto, on toasted bread, topped with pan-fried parma ham- delicious! 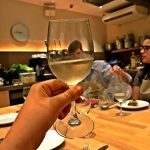 Then, all that was left to do was to prepare Carmela’s Festive Amaretto Tiramisu, and guests were able to enjoy another class of Zonin Prosecco, before sitting down to be served. When the evening drew to a close, and all tastebuds were satisfied, guests were able to take home their goody bag, which included Filippo Berio 100% Italian extra virgin, a fab kitchen gadget from Oxo Goodgrips, a classic kitchen piece from Portmerion, Maldon Salt, a selection of our brand new Crostini snacks, and 1 of Carmela’s books, signed by the lady herself. Our next event, in celebration of our 150th year is on the 23rd September with guest chef Mario Olianas, and it’s a traditional Sardinian cooking class and dining event. You can click here for more details and to secure your place.